Mistress Aneleda Falconbridge, taken by Jennifer Guyton. 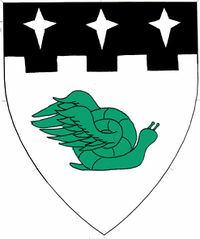 Argent, a winged snail contourny vert and on a chief embattled sable three mullets of four points argent. Mistress Aneleda Falconbridge lives in the Barony of Endewearde. She is a Companion of the Order of the Laurel, Order of the Silver Crescent, Order of the Maunche, and Order of the Troubadour. Sometimes she greatly resembles her ancestress, Æthleða Falconbro, a Norsewoman. She is often seen at her desk writing scroll text by candlelight, or writing tunes and lyrics, or singing and middling through songs on her harp. Otherwise, she may mostly be found by following the noise and the words. She was apprenticed to Mistress Mira Fennor of Argyll, and is a member of Thanet House, the household of Syr Cedric of Thanet. 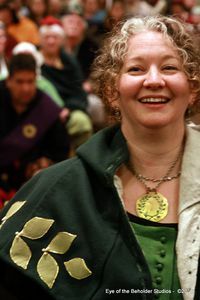 She has been playing in the Society since 2002, her first event being the Great Northeastern War and her second event being Pennsic 32. Aneleda Falconbridge is an Englishwoman living in the first part of the 15th century in Northumberland, aside the River Tyne. Her family were, in ages past, converted to Christianity by the monks of Iona, where their faith made the chill weather and rugged countryside more easily borne. An unpolitical family, Aneleda attended Mass at New Castle, where she learned the hymns, songs and prayers. She has, of late, been seen going off with the armies, and is spending more time at Court, often mystified by the whirlwind of players. Aneleda is married to Lord Andre Quiboit du Lait (Andrew the milk drinker) to whom she is the Sunflower of the Apocalypse. They have a son, Jesse. She enjoys performing, including vocal bardic arts, storytelling, and commedia d'ell arte, cooking, cordial making, combat archery, potable testing and general mayhem. She is a journeyman in the East Kingdom Brewers' Guild. Sometimes she greatly resembles her ancestress, Æthleða Falconbro, a Norsewoman. Aneleda's CD "I Am of the North" can be found and ordered at . Aneleda's original music, poetry, scroll text and other SCA projects can be found at www.mbouchard.com/aneleda. See and hear Aneleda and Jean's year of Royal Bardic Madness on YouTube at our channel TheJeaneleda or follow us on Facebook at Jeaneleda. Aneleda's modern counterpart, Monique Bouchard, works at a website development firm as client relationship manager. This page was last edited on 24 January 2018, at 14:39.